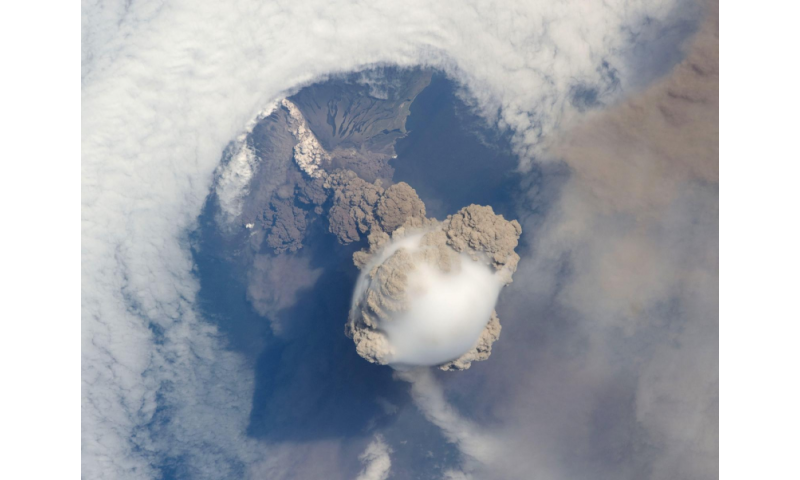 Large volcanic eruptions inject considerable amounts of sulphur in the stratosphere which, once converted into aerosols, block sun rays and tend to cool the surface of the Earth down for several years. An international team of researchers has just developed a method, published in Nature Geoscience, to accurately measure and simulate the induced drop in temperature. Considered the most important volcanic event of the 20th century, the eruption of Mount Pinatubo (June 1991) injected 20 million tons of sulphur dioxide in the stratosphere and provoked a global cooling of 0.4°C on average. To quantify the temporary cooling induced by the largest eruptions over the last 1500 years, whose magnitude exceeded Mount Pinatubo's, scientists usually adopt two approaches : dendroclimatology which relies on the analysis of tree-ring based proxies and climate model simulations in response to the volcanic particles effect. But until now these two approaches delivered results that were quite contradictory, and this prevented scientists from accurately assessing the impact of major volcanic eruptions on climate. Simulations showed greater (between two and four times higher) and longer cooling than dendroclimatic reconstructions. This gap even led some geophysicists to doubt the capacity of tree-ring based proxies to measure the impact of past major volcanic events on climate and to question the models' ability in simulating precisely the climate response to strong volcanic forcings. Today, researchers from the University of Geneva (UNIGE), Switzerland, the Institut Pierre Simon Laplace, IRD, the French Alternative Energies Commission (CEA) and the National Center for Scientific Research (CNRS), France, have managed to reconcile the two approaches and developed a method to evaluate accurately the consequences of future high-magnitude eruptions on climate to better anticipate their impact on our societies. In this multidisciplinary team, dendrochronologists came up with a new reconstruction of the Northern Hemisphere summer temperature in the last 1'500 years. This reconstruction is mainly based on maximum latewood density, a parameter which is very sensitive to temperature variations. Data has been collected throughout the Northern Hemisphere, from Scandinavia and Siberia all the way to Quebec, including Alaska, the Alps and the Pyrenees. The inclusion of density allowed clear detection of all major eruptions. Results show that the year following a large eruption is characterised by a greater cooling than asserted in previous reconstructions and that this cooling does not last for more than three years at an hemispheric scale. In parallel, using a sophisticated climate model, climate physicists calculated the drop in temperature caused by the two largest volcanic events of the last millennium, the Samalas and Tambora eruptions which both occured in Indonesia in 1257 and 1815. This model combines data about volcanoes location, the period of the eruption, the amount of sulphur dioxide injected, and integrates results from a microphysical model which simulates the volcanic aerosol life cycle from their formation, following the oxidation of sulphur dioxide, to their sedimentation and elimination from the atmosphere. " This unusual approach enables to realistically simulate the size of the volcanic aerosols particles and hence their life expectancy in the atmosphere, which directly influences both the extent and persistence of the cooling induced by an eruption ", explains Markus Stoffel, researcher at UNIGE. These new simulations show that disruption in ray exchange, caused by volcanic activity, were largely overestimated in previous climate simulations, used in the latest IPCC (Intergovernmental Panel on Climate Change) report. For the first time, results provided by reconstructions and climate models about the intensity of cooling converge and demonstrate that the Tampora and Samalas eruptions generated an average drop in temperature in the Northern Hemisphere fluctuating between 0.8 and 1.3°C during the summer 1258 and 1816. Both approaches also agree on the average persistence of the significant cooling which is estimated at two to three years. These results pave the way to a better assessment of the role played by volcanism on climate change. It is Highly Essential to move Sea water into Volcanoes & Hotsprings ASAP to Extract the abundant Thermal Energy available there for mankind. Just look at the Volcano Map. They are all near coastal regions.